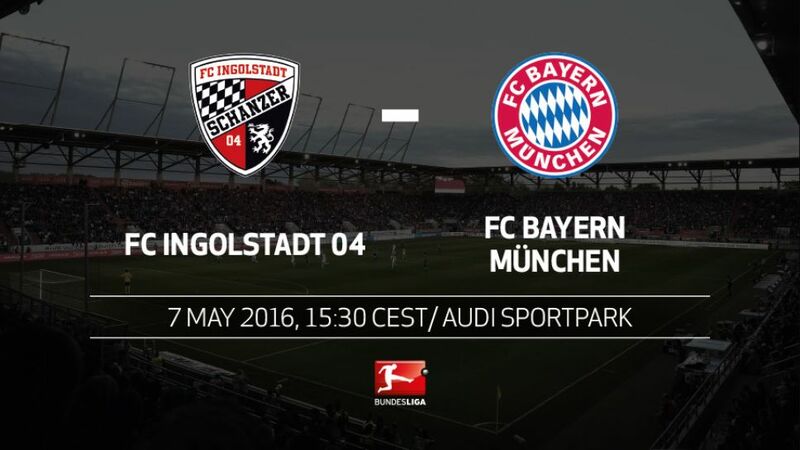 FC Bayern München will clinch an unprecedented fourth successive Bundesliga title if they avoid defeat at FC Ingolstadt 04's Audi-Sportpark on Saturday (kick-off:15:30CEST/13:30GMT). The Bavarian giants suffered an agonising UEFA Champions League semi-final defeat to Club Atletico de Madrid on away goals in midweek, and will be determined to make amends after missing the chance to wrap up a 25th Bundesliga crown in last Saturday's 1-1 draw with Borussia Mönchengladbach. Promoted Ingolstadt will be be hoping to kick-start a party of their own, however, in their final home game of the campaign. The Bundesliga first-timers have plenty to celebrate, too, having already secured their top-flight status for another year. Bayern secured the nominal Herbstmeisterschaft - the unofficial title for the Bundesliga leaders at the midpoint of the campaign - after battling to a 2-0 win over Ingolstadt on Matchday 16. The destination of the title has not been decided so late in the season since 2009/10.Bayern have not clinched the title in front of their own fans since 2000.Ten of Pep Guardiola's 19 competitive defeats as Bayern head coach have come in April and May (prior to Atletico second leg).Bayern have dropped twice as many points as they did during the first half of the season. They have also averaged two fewer goals per game.Bayern have won their last 24 Bundesliga matches against promoted teams – a Bundesliga record.Bayern's trip to Ingolstadt will be Guardiola's final away game in the Bundesliga as head coach.Ingolstadt have the fourth best defensive record in the division (37 goals conceded).Bayern hold the record for fewest goals conceded by a promoted team (38 in 1965/66).A 21st clean sheet for Manuel Neuer would represent a new single-season Bundesliga record.